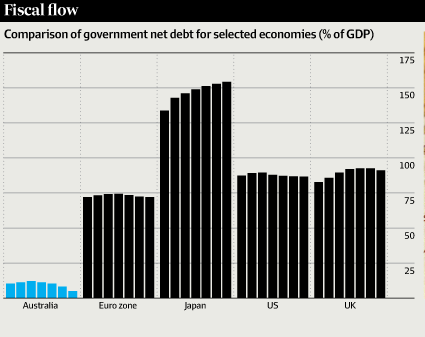 In their usual sloganeering fashion Abbott, Hockey, Cormann and others constantly refer to the ‘budget debt and deficit mess’ (or disaster) they inherited from Labor. 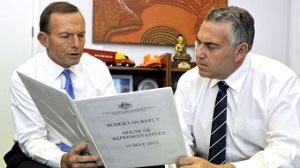 In the post Resolving the budget ‘crisis’ I attempted to show that Labor left the budget in reasonably good shape. In so far as there is a mess or a crisis now, the author is Hockey and company. From comments I may have not made the case plain. In what I hope is my last post on the budget of 2014, I lay out the case again, with additional information. 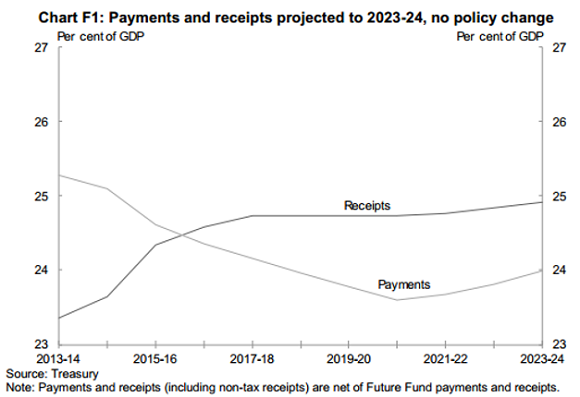 In the 2013 budget Wayne Swan went beyond the usual four-year projections to lay out expected receipts and payments over 10 years. He did this to reflect how the numbers would work out, given that the major payments for Gonski and NDIS did not cut in until after the four-year budget cycle. 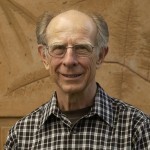 Swan left the budget in good fiscal shape. This graph has the budget back in surplus in 2015-16, an ongoing surplus of about 1% of GDP (about $16 billion) and a restoration of budget receipts to about 25% of GDP. The forecast assumed no tax cuts to offset bracket creep. In effect the government would take back some of the eight tax cuts delivered by Costello and the one delivered by Rudd. Six years of Labor had seen debt increase through the unaffordable tax cuts and Keynesian stimulation to counter the GFC. Nevertheless debt was modest by international standards. Hockey has done three main things. First, he has added $68 billion in debt over the four-year budget cycle. Second, he has delayed major cuts until the fourth year, as Ross Gittins has pointed out. (Ironically he has done this to stimulate the economy in transition from reliance on the resources boom. In fact consumer confidence tanked from the pre-budget talk of austerity and remains at levels of the 1991 recession.) 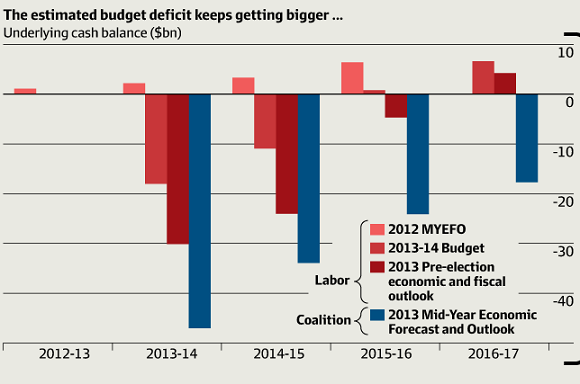 Hence the budget does not reach surplus until 2016-17, one year later than Labor. 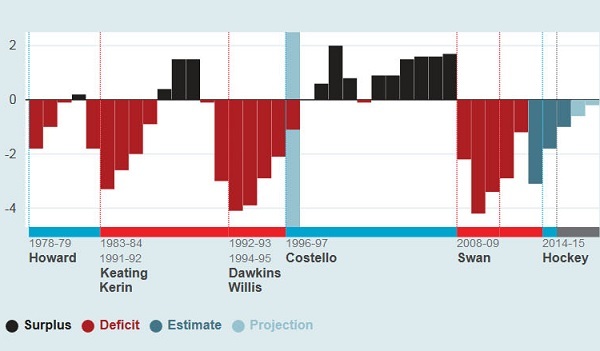 Third, Hockey has restrained receipts to 23.9% of GDP, according to Gittins, one election promise he has kept. 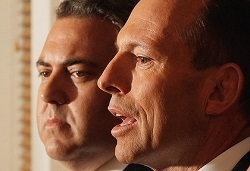 Hockey has put the budget into a straight jacket entirely of his own making. This decision is based on his austerity/small government ideology. The transition from Swan to Bowen to Hockey is reflected in this graph a form of which was published in the AFR at the time of the Mid-Year Forecast and Economic Outlook (MYEFO) last December. Swan’s embarrassment and a fair bit of the negative view of Labor’s reputation as an economic manager is reflected in the difference between MYEFO for 2012 and the 2013 budget. Swan/Gillard had bravely forecast a budget surplus for 2012-13, but had to give up and defer for two years because of failing revenue. Treasury and Finance seemed to be completely blindsided by what was going on but the repeated failure of revenue to meet forecasts made the government look incompetent. I understand revenue picked up a bit in the weeks before PEFO 2013, mainly due to better receipts from the mining and carbon taxes. I believe it was stable between PEFO 2013, Labor’s legacy, and MYEFO 2013, Hockey’s mess. In the overall narrative the focus should be on what Hockey has done in increasing the deficit and in establishing a 23.9% of GDP limit on receipts. Instead we have sloganeering and a welter of numbers in an attempt to sheet home the entire blame to Labor. The LNP keeps saying that they gave us the budget the country needed and that there was no choice. There was choice in the overall budget framework as well as the allocations within it, which privileges the rich and the corporates and punished everyone else. Infrastructure and defence have also received increases, beyond normal inflation, though the former is limited to roads, neglecting public transport. One sloganeering tactic is to state (true) that we are paying $1 billion in interest every month, and then rattle off what could be achieved with $12 billion extra in the budget. This entirely overlooks the need for debt to counter the GFC and the state we would have been in had we followed LNP policies. Another is to say that if nothing were done then in 10 years the debt would be $667 billion pa. No economic commentator has had a good look at this claim, but it’s based on the Hockey mess, not Labor’s as such. Based on that $667 number, they now have dazzled everyone with a ‘blizzard’, to borrow Bernard Keane’s description, of numbers derived from it. The interest bill becomes $2.8 billion per month, or $25,000 for each man, woman and child in the country, $100,000 for a family of four. Each Australian’s share of the interest would be $9,400 over the next 10 years, and so on and on. The graph is interactive. I’ve taken a screen shot with the blue marker bar over the socalled “Beazley black hole” It wasn’t a black hole and it wasn’t even Beazley’s as he was finance minister; Ralph Willis was treasurer. The deficit in that year was a benign 1.1% of GDP. The Tories have form, they specialise in lies. I’m inclined to think this present lot are liars, clunkheads or both, Laura Tingle’s assessment in 2010, and unfit for government. Using either gross debt or net debt, Mr Hockey’s claim that at the moment Australia is paying a billion dollars every month in interest on the debt that Labor left is exaggerated. A nice way of saying he’s lying. See also especially Hockey’s morality play.